Sweepstakes starts 6/1/13 at 12:00:01 a.m. ET, ends 9/30/13 at 11:59:59 p.m. ET. Open to legal residents of and currently residing within the 50 U.S and D.C., 18 years of age or older at time of entry. All federal, state, and local laws and regulations apply. Void where prohibited. 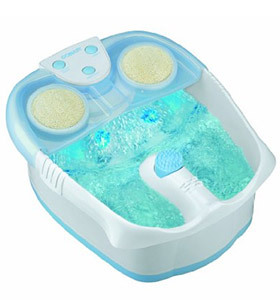 One (1) lucky prize winner will receive one (1) Conair Hydrotherapy Massaging Foot Spa. Odds of winning depend on the number of eligible entries received. OH My feet could sure use this. This looks like a self service spa treatment I would love to use weekly on my tired aching feet. Sure looks like it would make my feet feel wonderful. I owned one of these machines several years ago. I loved it!! I use to put calgon bath beads in the water and it was heavenly. Would love to win this so I can “pamper my puppies” again. Love to win this for my tired and swollen feet and heels as I cannot stand or walk for long,this would ease me to sleep deeply too.